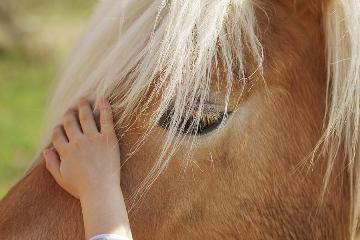 Equine Interactive Learning and Psychotherapy for children. What is Equine Interactive Psychotherapy and Learning? Equine Interactive Psychotherapy and Learning is a hand on, mind, body, spirit form of therapy that utilizes the wisdom of horses to assist in emotional growth and healing. The sessions can be performed on the ground or on horseback, and so no specific horse knowledge is necessary for participants to benefit substantially. Through interactive activities with the horses, youth have an opportunity to develop and practice positive emotional, behavioral and social skills which can be generalized to life at home, school and the community. Activities might include, grooming or feeding, as well as games, groundwork, herd observation, and journaling. The sessions will be led by a Certified Equine Specialist in conjunction with a Mental Health Professional. Both are skilled at looking to the horses for information. During a session, facilitators pay close attention to the horses' behavior, what the participants do and say, and the interaction between the two. These observations are then reflected back to participants so as to help them become aware of emotional and behavioral patterns they exhibit. Facilitators (human and horse) then support participants in practicing effective strategies and solutions for change. Equine Interactive Psychotherapy and Learning is especially beneficial for all children including children diagnosed with ADHD, high functioning Autism or Aspersers Syndrome. The Horse's large stature, strength and willingness to bond with humans, are qualities which inspire and motivate youth to engage in Equine Interactive Psychotherapy and Learning sessions. Magnificent and at the same time intimidating, horses challenge children to work though fear and to build self-confidence. Horses are honest, non-judgmental, and live in the present, qualities that promote the expression of feelings and provide a safe starting point for developing trust and a positive relationship with another living being. Horses are herd animals, which means that they are social and need each other in close proximity if they are to thrive. Observing and interacting with horses provides insight into what healthy relationships look like and offers opportunities to work on dynamics which arise in relationships like feelings of isolation, ineffective communication, boundaries, and frustration tolerance, to name a few. With few exceptions, horses are content to be followers if they find an assertive and fair leader. In this way, if you focus and establish a connection based on mutual trust and respect with a horse, he will be willing to follow you. Since Horses are prey animals, they have evolved into a highly sensitive and intuitive species. A horse's high emotional intelligence is what allows them to pick up on subtle signals from humans, and without any physical contact, sense our emotional states and respond accordingly. They are so attuned to behavioral nuances we exhibit, and feelings we experience, that if we pay attention to how a horse reacts to us, we are able to gain immediate and observable feedback around our unconscious emotions, behavior patterns, and ways of relating in the world.